And quicker than a flash, all the Wee Babies found a home of their own. These Wee Babies are so surprising, they take me quite a while to make, but they are always so darn quick to leave the nest! No matter how much I bribe them with honey toast, warm milk, cinnamon buns…they are always too happy to hop into baskets and head out. Adventurous little ones. 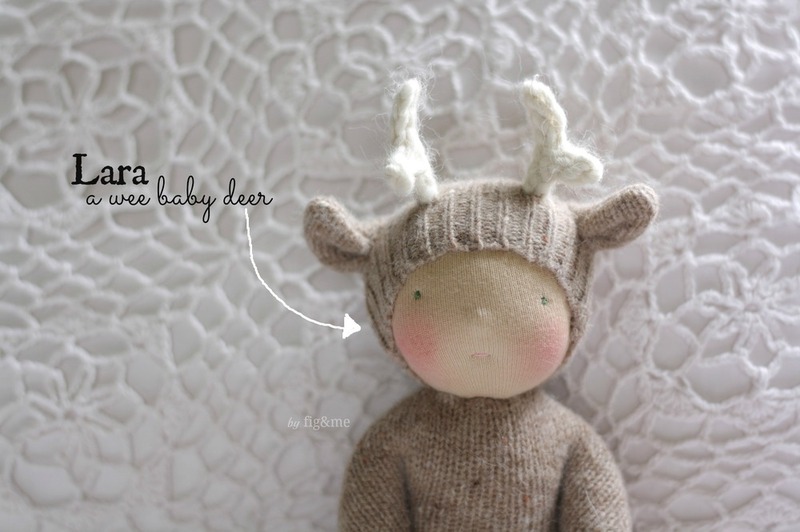 Lara, a wee baby deer by Fig and me. Clark taking a nap, by Fig&me. This time I decided to make a northern herd of wee babies. I turned to the constant inspiration of the antler theme I seem to be playing with this year, first making Tilly with her deer hat, then Bambi, and now this bunch of merry trouble-makers. 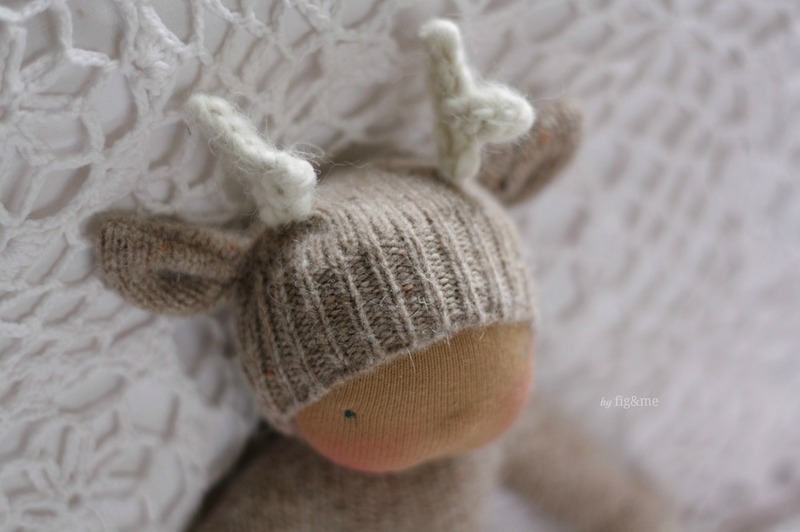 It seemed so fitting with the approaching holidays to make them in natural earthy tones with pretty antlers, so I had a few deers and reindeers ready to meet a family. They have all been packed (except one which got kidnapped on his way to the shoppe) and will be traveling today to their new homes. So exciting for them to be opened and played with. 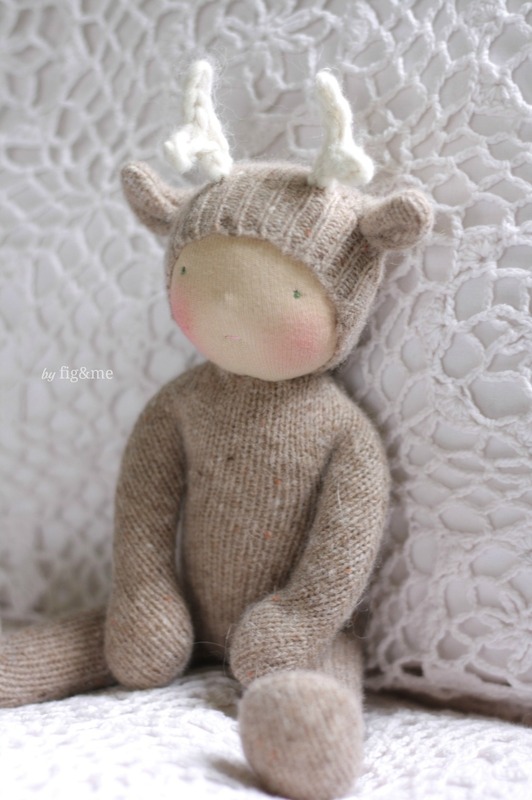 Shirley, a wee baby deer by Fig&me. Now, I know I don't make nearly enough of them to satisfy their demand, but that dissatisfaction is something I have learned to live with. Making everything by myself, and taking the time to take care of my hands and my ideas, is a very queer balance and one I strive for but not always achieve. I do however plan on making one last batch of them this year, before the holidays approach and I take my usual "rest" to craft for my children and my family. There are so many dolls in all sort of stages of completion over here that is very hard to gauge how many or when I will have them ready. I hope I can make it happen! I hope you all had a wonderful weekend, I went for a nice walk in the forest to collect a few more pine cones and pine needles, we attended the holiday parade down town and ate cinnamon sugar mini doughnuts and we are now gearing up for yet another busy week of elving and decorating. My daughters already have quite a stash of presents wrapped with masking tape and notebook paper, so I know the bottom of that tree will host many re-wrapped toys and crafty bits for me. I am looking forward!. Nov 21 But where do you get all these ideas? Nov 14 Not Dasher…and not Prancer. Jan 14 A little balm.